The Stand Up Paddle Board or “SUP Wailua” as it is called originated in Kauai took it on as their own and developed it in the ’60’s. They began with it to instruct large groups of learners and the higher stance gave them a better viewpoint, and gave them the control they needed, not only over the learner groups, but also to sight the pending swells way out the back. The Stand Up Paddle Board used a single paddle with a long handle that was used to great effect to propel them forward, and not much has changed today. What is a Stand Up Paddle Board? They can be best described as over sized surfboards that are fairly fat. but thicker or fatter, to offer good flotation. “SUP Wailua” can be “Custom Made” at a price, but most are shop boards, to keep the cost down, and board makers keep a standard or high performance model on hand in the showroom. These models are between, generally 9’6″ up to 12’6″ in some cases for the larger user, with the smallest size being most popular as a performance model. They also feature padded deck grip with concave or double concave bottoms, with three fins for turn and directional stability. “Sup’s” can be used pretty well any where, on the lakes, rivers, or for that big work out, used as the new surf weapon. This New Surfing Phenomenon, used in the surf for a complete fun work out, is set to explode in a Global fashion by exploring a new way of surfing, and rest assured a SUP Wailua Board, are set to be the New Surfing Phenomenon, and change the current idea of surfing forever. Beach vacations are what people would love most because of the exciting water activities. A lot of travelers love to prefer tourist destinations with water sources as it’d bring adventurous rides and enjoyment that can be cherished forever. Surfing has been a common preference of beach lovers even from the earlier days. But the world recently is experiencing a greater demand for stand up paddle board surfing. You know why? All because of the thrill and relaxing experience it offers. Stand up paddle boarding is a fun sport that involves standing with a paddle and heading out to the ocean to catch the waves. All what are required for this adventurous game are the surfboard and a pair of paddles. People in tropical areas are quite familiar with this sport whereas paddle boarding is new to the riders of most parts of the world. The fun and enjoyment offered by the sport made it world-famous and it’s now seen that more and more people opt for this exciting sport event for making memorable vacations. And an interesting thing about this fun filled water sport is that it requires just a minimum of equipment, which can be used to paddle oceans, lakes and rivers. Paddle boards are available in a range of sizes and styles and vary with users according to their experience. Flatter boards are the right choice if you’re a beginner whereas there are narrower boards that have to be used only by experts for added thrill and excitement. Stand up paddle boarding has a great advantage of being an amazing workout for human body. Not only your physical body but also your mind gets refreshed aiding in a strong and relaxed mental health. You stand in your full height throughout the activity and so get chances to explore sea life and beautiful views of oceans. Paddleboards are designed with built-in handle for beginners to enjoy this joyous sport. Not only is the paddleboards used in streaming oceans but can work the best in calm water sources that’s free from any obstacles. Learning stand up paddle boarding is easy but it’s a little bit hard to gain skills for making effective moves in water. To accomplish that, it’s necessary first to practice balance in flat water sources. It’s quite common to make mistakes in the beginning but once if learned, you’ll have a lot many fun in water. Whether playing in the waves, making turns or learning new exciting moves, you’ll find utmost enthusiasm with SUP Wailua boards. Stand up paddle boarding is an exciting water sport that’s becoming popular in the recent times. 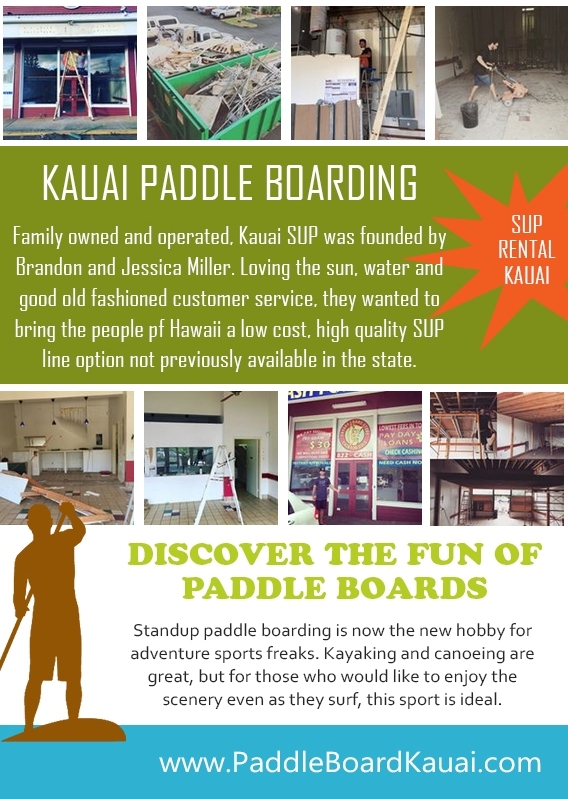 Visit Here for getting more information related to sup rental kauai .